The world has seen something of a revolution in architecture in recent years, with cash-rich real estate developers in the developing world falling over one another to build the tallest, coolest, craziest new skyscraper. Construction information company Emporis has been keeping track of all those projects for the past 12 years, handing out an annual award for best new skyscraper. Canada didn’t place in the award’s top 10, but Toronto recently won a more dubious honour from Emporis: It was named “North America’s new high-rise metropolis,” a distinction that may bring out Torontonians’ pride, if it didn’t hint at a seriously overheated housing market. Check out the top 10 winners of Emporis’ skyscraper awards. The winners were chosen by Emporis’ panel of judges, who are architecture experts from all over the world. This office tower in the booming Chinese city of Tianjin has a 360-degree lookout at the top and is the world's tallest steel-only walled building. Designed by globally renowned architect Daniel Liebeskind, this condo comples features 1,129 apartments in six skyscrapers and 11 low-rise buildings. Three sky bridges connect each of the high-rises, and the crowns at the top hold gardens. 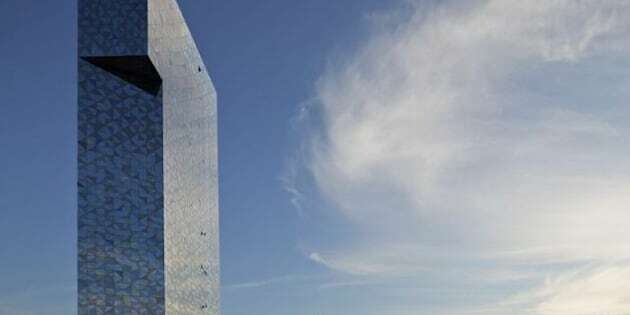 South Korea's tallest building is part office, part hotel and part residential, and the building's floor plates gradually shift from trapezoid at the bottom to triangular at the top. No, this building isn't suffering from some sort of real-life pixelation; its upper 39 stories are rotated around the building's central axis to give it the appearance of a helix. The building's bottom 13 stories are all parking garage. Cincinnati's newest landmark was 20 years in the making, but is now the city's tallest building. The "tiara" at the top was evidently inspired by the Cinci's nickname, the "Queen City." Not what you'd normally think of when thinking of Stockholm, the Victoria Tower is now the tallest hotel in Scandinavia. Its facade "incorporates eight different types of glass distributed randomly over the surface so that no regular pattern can be detected," Emporis reports. The tallest building in Shenzhen is three quarters office tower with a hotel in the top quarter. The building's lower levels house a shopping mall. Five towers ranging in height from 56 to 79 stories in height comprise this complex in the United Arab Emirates. Like some other new buildings in the U.A.E., its shape is meant to evoke sails, a reference to the city's heritage as a port. This building is something of a chameleon, reflecting three glass surfaces towards the water and one stone one towards the desert. The building's lobby is 60 feet tall. Legendary architect Frank Gehry says he designed this building to look like it's been draped with fabric. Gehry achieved the effect by shifting the apartments' bay windows slightly from floor to floor. Also known as New York by Gehry, it's the second-tallest residential building in the Western hemisphere.